CITES #CoP17, the largest-ever meeting of its kind, will consider 62 proposals to change CITES trade controls affecting close to 500 species put forward by 64 countries from across every region. Over 2,500 delegates, including those representing more than 180 countries, are due to attend. CITES Secretary-General John E. Scanlon has described the conference as “one of the most critical meetings in the 43-year history of the Convention”. Changes to trade controls for the African elephant, white rhinoceros, lion, pumas, pangolins, silky and thresher sharks, devil rays, nautilus, peregrine falcons, African grey parrot, crocodiles, flapshell turtles, the Titicaca water frog and psychedelic rock gecko, as well as the Grandidier's baobab tree and many species of rosewood, and other animals and plants will all be decided upon. CITES Parties will consider new decisions on combating corruption and cybercrime, the better use of modern forensics and specialized investigation techniques, anti-money laundering, and enhanced cross border cooperation in combating illegal wildlife trade, as well as targeted demand reduction strategies. Decisions will be taken on matters affecting domestic trade in elephant ivory, trade in mammoth ivory, management of ivory stockpiles, international trade in elephant ivory and rhino horn, and a decision making mechanism for ivory. In total, there will be over 120 side events, including the screening one of the winners of the UN World Wildlife Day Elephant Film Festival in March this year. The inaugural Youth forum for People and Wildlife will take place ahead of #CoP17 in Johannesburg. The forum, a first for CITES, will bring together 34 committed young leaders (aged 18-25) from 25 countries around the world to work on issues such as animal welfare, wildlife conservation, wildlife trade and sustainable community development. 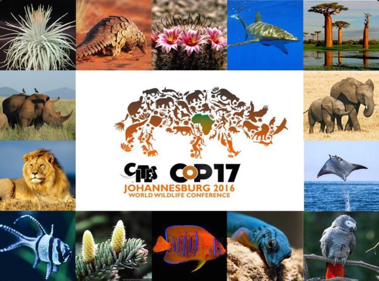 Johannesburg, 23 September 2016- The Convention on International Trade in Endangered Species of Wild Fauna and Flora (CITES) will hold its triennial conference at the Sandton Convention Centre in Johannesburg, South Africa from 24 September - 5 October 2016, known as #CoP17 or the World Wildlife Conference. This is the first time CITES has met on the African continent since 2000. Proposals include the protection of marine species such as silky and thresher sharks and devil rays; plant and timber species, such as many rosewood species and the Grandidier's baobab tree and as well as African elephants, white rhinos, lions, pumas, the African Grey parrot and Nile crocodile together with many frogs, lizards and snakes. In addition to enforcement-related decisions and resolutions to combat illegal trade in wildlife, #CoP17 will consider a powerful set of proposals to reduce demand for illegally traded wildlife specimens, and how to better engage with local communities' to ensure they benefit from the wildlife they are living amongst, reflecting the three-pronged approach taken under CITES to address poaching and wildlife trafficking. • 100 days left before the World Wildlife Conference – CITES #CoP17 – kicks off in South Africa!